This latest industrial incident comes after more than 16,000 dead pigs were recovered earlier this year from a river that runs through Shanghai. China has faced increasing pollution problems as a result of decades of fast economic growth. The chemical firm, identified as the Hubei Shuanghuan Science and Technology Stock Co, has been ordered to suspend operations, Xinhua reported, after officials said sampling of its drain outlet showed that ammonia density far exceeded the national standard. There was no immediate comment by the company. No figure was put on the number of dead fish recovered, but officials said a 40km (15 mile) stretch of river had been cleared. 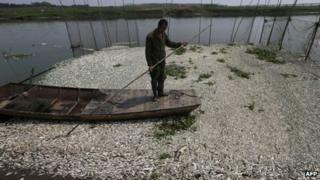 "The dead fish covered the entire river and looked like snowflakes,'' village Communist Party secretary Wang Sanqing was quoted by the Associated Press news agency as saying. He added that the incident could result in the loss of up to 70,000 yuan ($11,400; £7,300) in daily earnings for the village's 2,000 fishermen.